Carl Jones is a 21-year-old with an intellectual disability who recently graduated from the Lake Oswego School District Transition Program. Everyday Carl is scheduled to work he rides his bike from his home in Lake Oswego to the bus stop, takes the bus to Beaverton and starts his job. He is motivated and happy to work, despite the hour-long commute. Like many other young men, he enjoys the outdoors and hunting, is an Eagle Scout through the Boy Scouts of America and has longed dreamed about his first job. Because finding employment can be challenging for people with disabilities, Carl was referred by the State of Oregon, Department of Vocational Rehabilitation to Dirkse Counseling and Consulting, Inc. for job placement services. Glenn Bishop, Senior Employment Specialist took his interests, skills and abilities into consideration as part of the job search process. Mr. Bishop contacted Leupold and Stevens, a fifth-generation family-owned company that designs, machines, and assembles binoculars, rangefinders, spotting scopes, riflescopes and mounting systems at their facility located at 14400 NW Greenbrier Parkway in Beaverton. Mr. Bishop was given a tour of their facility and worked closely with Human Resources and Management to make suggestions about incorporating Carl’s skills into their workforce. Leupold and Stevens is a local company with a diversity and inclusion initiative that includes hiring individuals with disabilities to contribute to their team. 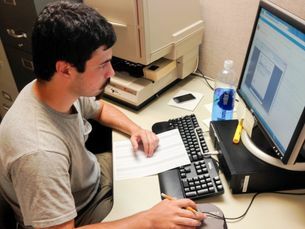 Because of the attention to detail that Carl displayed in his working interview, he was hired to do a job requiring that skill – scanning micro fiche into the computer – and was later given further responsibilities of carefully folding and storing important blueprint documents. Carl recently shared with Mr. Bishop “I like this job and I am looking forward to working here a long time.” The team at Leupold and Stevens sees the potential for fulfilling a business need that also fits in with their diversity plan creating a “win-win” for everyone. Dirkse’s services were a good match for my son and I really appreciate the results.